Home to one of the seven wonders of the world, Cambodia features a deep history, spanning across centuries from the Khmer Empire to the Khmer Rouge. The country is currently experiencing a rebirth, making this destination a truly unique place to visit. Most often, travelers spend only a few days in Cambodia to see Siem Reap, before continuing to the neighboring countries of Thailand or Vietnam. However, Cambodia has so much more to offer outside of its classic highlights. Check out some of our latest activities below, which feature a more in depth appreciation and insightful understanding of this magnificent country. On this day tour you would travel to the Kampong Khleang Floating Village, approximately one hour outside of Siem Reap. Imagine wooden houses on 10-meter-tall stilts, surrounded by water in the wet season, and on the flood plains of the lake in the dry season. Driving along a dirt road to the village, you would see wooden houses and traditional fishing equipment, as well as small children waving to say hello as you arrive. You would meet with a local family, to visit their traditional stilt home for some tea and coffee. You would then proceed to walk around and explore the village, learning more about life on the lake and the traditional fishing techniques employed there. After a delicious lunch, your meaningful work would begin with a water filter installation. With the assistance of your guide, you would set up the water filter in the home of a recipient family, providing them with clean drinking water for the next five years! 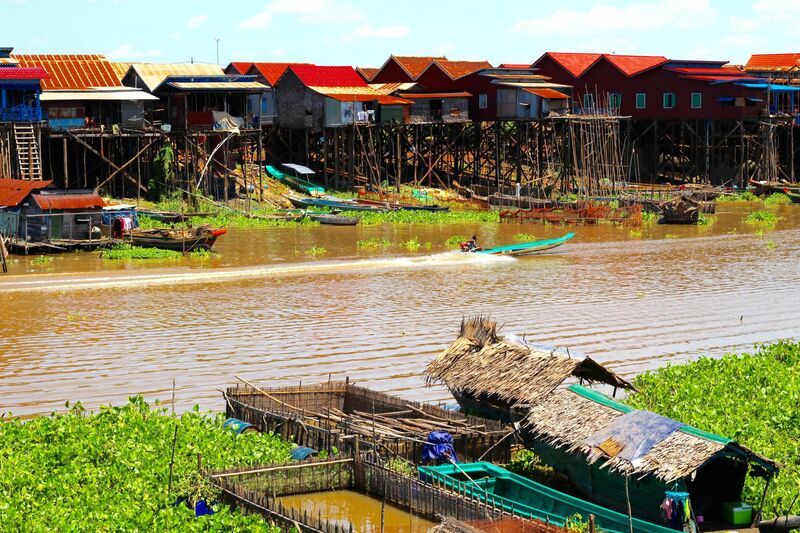 On this day tour, you would be taken on an excursion to Mechrey Village on Tonle Sap Lake. This adventure takes place about an hour outside of Siem Reap. Along the way, you would stop for a leisurely stroll through the traditional village of Ampil Peam. Time has nearly stopped in this village, where locals have lived nearly the same way for centuries. Afterwards, the journey continues to Mechrey, a small community on Tonle Sap Lake. Here, you would board a local-style boat to explore the area. This interesting excursion includes a discovery of the nearby flooded forest. Your guide would explain the biodiversity in this area, and discuss the importance of the lake for the livelihood of thousands of locals. Tonle Sap, meaning "Great Lake", is in fact a combined lake and river system. Learn about how its flow changes direction twice a year, depending on the season. It has been declared a UNESCO biosphere, recognizing its great importance to the surrounding eco-system. On this day tour, you would be taken on a scenic drive to the mid-10th century Banteay Srei, regarded by many as the jewel in the crown of classical Khmer art. This site is well preserved and its relief carvings are among the most accomplished that Angkor has to offer. An outstanding example of its deep relief is the east pediment of the southern library, which shows Ravana trying to shake Mount Kailasa. On the way back to town, you would have the option for an additional stop to see the Les Artisans D' Angkor. This is a network of Cambodian craftsmen and women, sponsored by the Cambodian government and "REPLIC", a European program. The purpose is to educate young Cambodians in traditional skills, such as woodcarving, stone carving, lacquerware and silk weaving, as well as providing them with a livelihood by marketing their products. This exciting wildlife excursion begins with a stop at the local market to buy fruit for the animals. You would have the chance to hand feed the female elephants and observe how they are trained, using gentle reward-based positive reinforcement. Then, you could even assist in changing Chhouk's prosthetic foot. 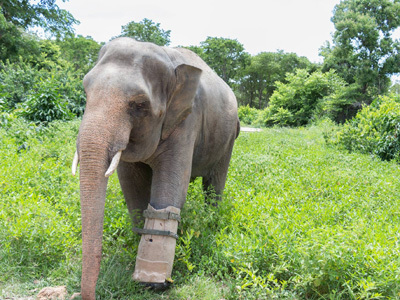 This lovely elephant has learned to walk with a prosthetic foot, a unique sight, that is extraordinary to be a part of! Afterwards, you would have exclusive permission to enter the tigers private den, a section that is typically closed to the public. This afternoon, a delicious Cambodian-style lunch and fresh coconut water would be served, as you escape the heat and relax in the swinging hammocks.Your wildlife encounters continue, as you could observe leopards, gibbons, otters and other endangered animals.The Wildlife Alliance has helped rescue and care for all of the creatures at the sanctuary. You would visit the nursery in the rehabilitation area next, another section normally closed to the public, to admire the baby animals up close. And lastly, you would feed the rescued baby macaque monkeys in their enclosure, for the perfect way to end this memorable day. This evening, you would be returned to Phnom Penh around 5:00 PM, unless an earlier drop off time has been arranged. This day tour begins with a 1.5 hour scenic cruise in a wooden boat to reach the small island of Koh Dach. Situated on the Mekong and sufficiently isolated from the capital city, Koh Dach is renowned throughout the country for the quality of its silk. This off the beaten path destination features an authentic side of Cambodia, especially apparent in its art of silk weaving by hand. Following the boat ride, bikes would be waiting for a cycling adventure through the small back roads. En route, you would have the chance to mingle with the local people, meet the talented weavers and admire the lush countryside. This afternoon, your lunch would be prepared by a generous Khmer family, before riding to the other side of the island. After boarding the boat back to Phnom Penh, the final activity of the day would be a visit to the Russian market built in 1937, that features splendid colonial architectural style. 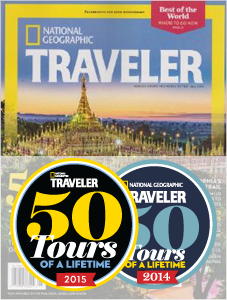 To learn more about how you could incorporate one of these unique Cambodian experiences, click the "Start Planning" button below and one of our Cambodia Travel Specialists will contact you directly. Check out our Cambodia tours page as well, to get ideas from our sample itineraries. All of our trips are fully customized to your specific requests, so contact us for more information.